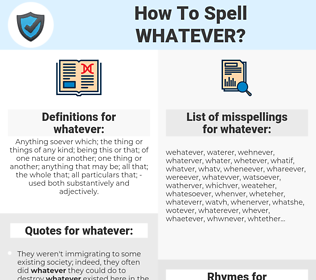 What are the misspellings for whatever? What are the common mistypes for whatever? 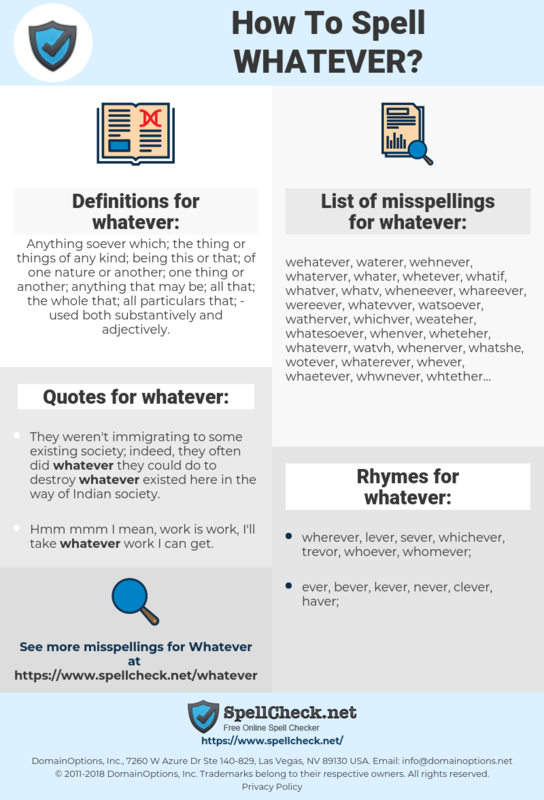 What is the definition of whatever? What are the quotes for whatever? What are the rhymes for whatever? What are the translations for whatever? What are the common typos for whatever? Anything soever which; the thing or things of any kind; being this or that; of one nature or another; one thing or another; anything that may be; all that; the whole that; all particulars that; - used both substantively and adjectively. This graph shows how "whatever" have occurred between 1800 and 2008 in a corpus of English books. enige, wat, ieder, elk, hetgeen, wat ... ook, welk ... dan ook, wat ... dan ook, wat voor ... dan ook. tout ce que, quelconque, quoi que, n´importe quoi. was immer, alle, welk, was auch, alles (was wir wollen). であれ, 何であれ, 何事も, 何ら, 何等, なんとでも, なんら, 何とでも, なにごとも, 儘よ, どちみち, なんであれ, ままよ, なにら. cualquier, cualesquiera, todo lo que, lo que sea.